This guy is legit. 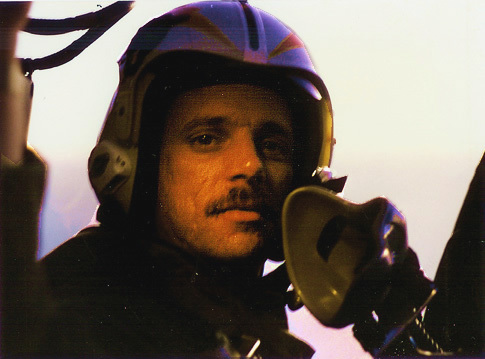 Leland Shanle, retired United States Navy Aviator, joins us to talk about his seasoned career. 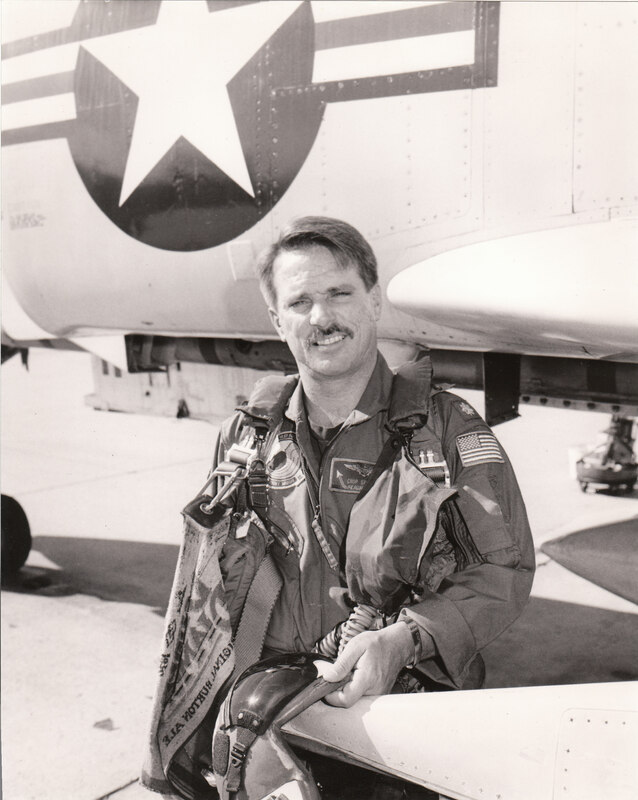 We start with his career in the Navy, flying such aircraft as the F-4 Phantom II, EA-6B Prowler and TA-4 Skyhawk. Then we move onto a bit about his airline career, first starting off in 727’s, then MD-80’s, and now flying international routes in a 777. Leland also discusses a bit about Memorial Day and what it means to him as someone who lost comrades in the military. This guy has way too much experience for just one episode of AviatorCast, but we did our best! A huge thanks to Leland for joining us on the show. Leland, it was an honor. Thank you for serving our military, inspiring us with your stories, and also the continued work you do for aviation. Throttle On! This is AviatorCast episode 66! From sea to shining sea! Chris: Welcome, welcome, welcome aviators, you’ve landed at AviatorCast. My name is Chris Palmer. From a young age, I looked to the powerhouse B-51s and beautiful B-17s with awe and admiration. Yes, these are incredible flying machines but for me, it was more about the men that flew them. A generation, the greatest some say, that through war and honor paved the way for aviation today. It’s Memorial Day so a big thanks to all of you who served in the military or have served and a big throttle on to all those who have paid the ultimate sacrifice. We truly honor you and thank you for your service. So welcome to this, the 66th episode of AviatorCast. It is fantastic to have you here on board. AviatorCast is where we talk about aviation passion each and every week. If that is a lesson of some kind or a topic of some kind or like today when we talk with an inspirational aviator. So today, we’re going to be talking to Leland Shanle. Leland is quite a diverse aviator. He was a naval aviator to start, and then he ended up getting in the airlines where he has been now for about 16 years but he has delved into being an author of some historical fiction books in addition to a production studio that he has that recently did a very cool thing on a documentary apparently with crashing a 727 that was basically a drone. So Leland is a really great guy. We’re going to get into that interview here in a few minutes but first as always, we read a review from iTunes. Again, if you leave a review on iTunes for AviatorCast and it is read on the show, then we will send you a free AviatorCast limited edition t-shirt. Thank you so much BroadwayBlues. Really appreciate it. I am glad that you are finding some information here that you’re having a hard time finding other places. Yes, we are all about humility here on AviatorCast. We believe that is a core function of a great aviator, and so I try to share that humility with others. I am glad you see that and I am glad you’re picking up on that and I’m glad that you’re learning something. Again, BroadwayBlues, if you hear this review, send me an email at me@aviatorcast.com and I will send you an AviatorCast t-shirt. Again, thank you so much for your review. I really appreciate it. Alright guys, so we’re not going to delay too much longer. We’re going to get right into this interview. Fantastic guest. He has a lot to share and I think you guys will be a little jealous of his cool factor on being able to land on carriers among other things. So here we go, let’s get into it with Leland Shanle. Chris: Alright everybody, we are honored to have Leland Shanle with us today. How you doing Leland? Leland: Doing great. How are you Chris? Chris: Fantastic. Where are you coming to us from in the world? Chris: Saint Louis, Missouri. Smackdab in the middle of the US. And Leland, what is it that you do for a living? Tell us about that. Leland: Well, my day job, I’m a 777 FO, Boeing-777 for American Airlines based out of Miami actually but I commute from St. Louis down. And then, I write and also have a little production company. Chris: Right on. Great. We’re going to get to talk about all of those. You also have some military experience, correct? Chris: Great. And tell us just briefly about that. We’re going to get into it in more depth later but what’s your military experience like? 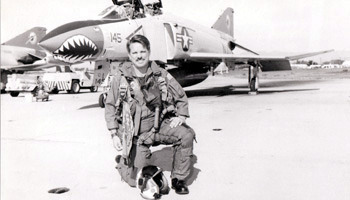 Leland: I was a naval aviator. I went through Navy ROTC here in University of Missouri. And then went to flight school in Pensacola, flew jets and was EA-6B Prowler pilot by trade by I also was lucky enough to fly the F-4 Phantom and the A-4. Chris: Great, great. Now the first question I ask everyone that’s on our show and it’s kind of a basic question, we’re going to take you back many, many years, and that is how did you initially fall in love with aviation? When did all of these stuff start for you? Leland: Wow. You know, to be honest, it’s all I ever wanted to do. I grew up in an aviation family. I had two uncles who were military pilots and my grandfather had managed an airline. I think it was in the mid-20, late-20s when he got back from World War I. That’s just all I ever wanted to do. So I went to ROTC as soon as I graduated high school and signed up there and University of Missouri was the only place, or the only school in the area that had navy. And my uncle Larry had been killed as a naval aviator and just kind of wanted to follow in his footsteps. Chris: Gotcha. Do you mind telling us where he served and a little bit about him? Leland: Sure. He was an academy graduate, went to the naval academy. Larry Manses was his name and he flew the, well the navy back in those days called it the Able Dog, the AD-1 later became the A-1 Skyraider when they relettered and numbered the airplanes. And he flew in Vietnam and then returned. He flew early in Vietnam. Returned and was in the reserves out of Glenview, Chicago in 1966 and was killed in an S2F Tracker on a training mission. Chris: Wow. Well, I definitely want to touch on later about your feelings on I guess veterans and Memorial Day because today as we’re recording this, it is Memorial Day. I think it’s really cool that the stars kind of aligned that someone of your caliber has been through the military, that has a pedigree in the military. It will be great to kind of get that perspective of aviation history and I guess even patriotism you could say so. We’ll definitely get into that later. Let’s get into your flight training a little bit more. Tell us what it is like for a naval aviator to learn to fly. Tell us what that process is like. Leland: Well, first thing you got to do is get a college degree and it doesn’t really much matter what’s it in. I was an education major. I wasn’t big on math. And it’s a little tougher these days. I don’t know if I could get in these days. They like engineers a lot more than in my day. You could get in with the liberal arts degree like I had, and you go through… There’s a few ways, you can go through Aviator Officer Candidate School where you go there after you graduate. My youngest son is actually doing a similar thing right now. He’s putting together a package with the marines. He wants to go fly for the marines. And I did the ROTC route, so all through college I was doing ROTC a couple of days a week. And then once I graduated, I went to aviation indoctrination down at Pensacola and then I was fortunate enough to be one of the last guys to fly the T-28 which was a great ol’ airplane. Radial engine and 1400 horsepower. For a Missouri kid who had never flown before, it was an eye-opening experience especially at first takeoff. Chris: So that was first aircraft you had ever flown in? Leland: Yes. I’d flown I think only tice in my life, maybe three times before that, once in an airliner, once in a Cessna, and now I take it back, I went to the airborne school, so I went up five times but didn’t land those five times, I jumped out. Chris: Gotcha. It doesn’t count. Leland: Yeah, that doesn’t count. Anyway, that was really my first experience. I think the first week I was flying for the navy, I doubled the amount of flight time I had in my life. So it was different but I always told people, it’s a system designed for the average person with above average motivation. It was nothing that was really that hard. You just had to apply yourself and it really had to become your life for the two and a half years it takes to get through it. And I was fortunate enough, I got check grades and actually went back to Pensacola to fly the T-2C and in the T-2 you learn, that’s a primary jet, and straight wing, looks like a 50s vintage jet fighter, and we flew that in formation, gun hops and then you took it to the ship. That’s got my first traps on a Lexington old wood deck. She was getting pretty tired even then. Chris: That’s a World War II carrier isn’t it? Leland: Yeah. It fought in World War II quite a bit, extensively in World War II. Chris: Right. Wasn’t it in the Battle of Midway or something like that? Leland: No. The original Lex was sunk I believe in the Battle of Coral Sea. Leland: And the next carrier they renamed the Lexington. It come out of the yards. So I don’t think it was in Midway but it was in just about the rest of the war. It really was all over the South Pacific and it hadn’t changed much. The deck was still wooden. They put an angle back on it but other than that, it hadn’t really changed. It’s down in Corpus Christi now as a museum. Leland: Then after your carrier qual in the T-2, then you start all over again in the A-4. The A-4 is a light attack airplane, flew a lot in Vietnam and we flew the two-seat version. And then you learn all the standard stuff formation, night formation, low levels, and then also the weapons. Weapons delivery, rocket spams, guns, and then also air combat, basic dogfighting. Then you go to the boat again. If you qualify at the boat, then you go to get your wings. And then after you get your wings, then you get a fleet aircraft and fleet boat or fleet plane. You go to the FRS Fleet Replacement Squadron, and that takes usually six months, and for me it was the EA6-B. And then you learn the aircraft and the weapons specialty. For the Prowler, it was electronic jamming and taking up same sites, kind of a wild weasel mission that the air force did. We used harm missiles for hard kill and soft was jamming. And then when you’re done, you go back to the boat in the specific aircraft and the big difference then is you take it to the boat at night, which that causes some washout rate. At each stage, there is a certain percent of washout rate. And then, once you get through the FRS, then you get sent to fleet squadron. My first fleet squadron was VAQ-136 on the Midway. We are for deploy in Japan. Then you really get to start learning. Chris: So tell us a little bit about landing on a carrier at night because I think that’s one of those things that is well-known in the aviation community. It’s probably one of the most difficult things to do as a pilot or an aviator. Was it difficult for you? What was the experience like? Tell us a little bit about that. Chris: Yeah, I got a lot of them. Leland: But basically, you go on a manual holding on a radio and distance from the ship, and you push down from the marshal stack. It’s like airliners hold sometimes for weather, except the whole air wing will be stacked up and then you have to push at your point plus or minus 10 seconds. And this was back in analog base so we are trying to do all these on the clock and everything. So when you come down, you shoot attack and penetration and you arch at 12 miles until you get to the final bearing of the actual ship. And then you come up the ship’s final bearing at 1200 feet, put your gear flaps hook now and then you’ll start flying the needles. We have raw data, ILS. I also had the ACLS which was more accurate system but they had to lock up your airplane, and so a lot of times it didn’t work very well. And then later the ACLS system was tweaked for the Hornets and it would actually lead your corrections, well for the rest of the fleet airplanes we hated that because we wanted to know where we were, not be led by a computer. So my last two cruise is I just used the ILS. The ILS is just a needle that moves left and right that shows you’re on course, and then another needle that moves up and down. Once you’re on glide slope, you just want to keep centered up on the attitude reference and then at the same time you had to fly constant, what we call angle of attack. You don’t flare at all. The way you fly an approach of the ship is glide slope is control with all power. You really don’t move the nose, you trim it up to an on-speed condition, optimal angle of attack, and then you maintain glide slope with just the throttles. And so you hold that cocked up attitude. Then when you get to three quarters of a mile, you take over it visually and fly the Fresnel lens. It’s kind of like a unit directional stoplight, each cell you can only see if you’re lined up with it. And it’s got green datum lines. So if you keep the yellow light in the center of the green datum lines, then you’re on glide slope. And it takes a shape of a ball that’s why you also hear the navy guys call it the ball and all that. The light is round so just to simplify it, they always call it the ball. And then you transition line up on the boat, you can see centerline lights, you see a carrier box basically and they got airplanes parked on both sides and landing areas so you can’t wander off offline or you’ll drag a wingtip to the noses and radars of other aircraft and they get excited about that. Chris: Yeah, I can imagine. Leland: And then if you got your optimal angle of attack and the glide slope and the lineup squared away, it should put you right in the 3-wire and the 3-wire will you pull you to a stop, get your flaps up real quick, fold your wings because someone is right behind you and then the worst part starts and that’s the taxiing around the ship at night. And that can be scary especially in the Prowler because we sat well ahead of the nose gear so we’d actually be out over the water sometimes when they were turning us on the elevator or up on the bowl so it was interesting. Chris: That’s a little weird. I guess I never thought of that. I would think that they kind of just connected a tug or something to it and got it out of the way quick but it makes sense that you just I guess power out where you need to go. Leland: Yeah. You have to get out of there quickly, and they’re moving so many airplanes. Generally the way a launch works is a cycle we’d call it was we’d launce the aircraft first and then as we’re finishing up the launch, if you’re one of the first guys down, you could see airplanes in the landing areas as you are approaching as they were still shooting off the waste catapaults or moving them up to cat-1 or 2. And so it’s very time critical, it’s very, it’s kind of like a ballet really. Everything is choreographed, everything is moving in one motion and airplanes are being refueled, rearmed if you’re in a combat zone, and lot going on. A lot of young men and women up on the flight deck, most of them around 18, 19 years old, and they work hard, they work 20-hour days up there and it’s pretty dangerous as well. Chris: Yeah definitely. Everyone has to be diligent and like you said, choreographed. I can imagine, just has to be so organized. Chris: So tell us about, continue on with your navy career from there or your military career in general and where you went from there and maybe into some of the action that you saw, stuff like that, why don’t we go that direction now? Leland: Okay. After the Midway, I came back to Texas to be an instructor in the A-4 and I was an A-4 instructor, I was also an LSL, landing signal officer, that’s a pilot stands out on the deck and helps guide other pilots in especially at night, it’s critical. Chris: So he’s the guy that would be talking to you on the radio basically? Leland: Yeah, yeah, in close. And giving power calls or waving off or just sweet talking guys on a rough night. Sometimes the deck will move so much that you can’t really use the lens and so the LSL will get them aboard. We have a backup system that we actually control, it kind of looks like the ball, looks the same except we’re moving the actual visual presentation called the movelus, and that’s for one a deck, it’s really moving. The midway moved a lot. The deck was really unstable, hitched quite a bit and hold, but anyway. So I went back teaching the youngsters how to fly the A-4 and land on the ship and did that for three years, and then I went back to the fleet as a department head with VAQ-137 and VAQ-137 we deployed to Bosnia when that action was going on, we’re flying over Bosnia everyday to try to keep the, I guess the Serb Air Force from flying their migs. Chris: Its’ more of the presence of power sort of thing? Leland: Yeah, we were trying to just keep them out of the air so they wouldn’t use the bombers. When Yugoslavia broke up, it was pretty much a three-way civil war over there between Serbs, the Bosnians and then the Dalmatian Coast, I forgot what group that was but anyway. So we did that for months and then the Black Hawks were shut down in Somalia. So we went through the Suez Canal and then down off of Somalia for, oh we were down there a couple of months as well and that was interesting. And then on the way back through there, we flew over Iraq, a couple of missions over Iraq while we were on the Red Sea, went back to the Suez Canal, flew a couple of missions up from Southern Mediterranean, a long 7-hour mission up to film mass graves. I was covering the tarps bird. Tarp is a pod that hangs on a Tomcat back in the day and it was a photo pod. It could take high resolution photographs of ground, and we went up, filmed the mass grave up in Bosnia again and then come back and came home and then stood back that squadron. There were a lot of cutbacks after the first gulf war so we stood down that squadron and I went to another squadron and went right back to sea and on that cruise, we spent five months flying over Iraq during the deny flight stuff over Iraq. Leland: And then after that, I went down to Naval Weapons Test Squadron Point Mugu, California, just north of LA and I flew the F-4 there as a test pilot and we got to do all of kinds of crazy stuff with F-4s and even got the test ejection seats, didn’t ride it but I popped it out of my airplane, that was pretty neat. And did a bunch of other stuff and then after tour, I retired and went to the airlines. Chris: Gotcha. Cool. When did you start writing by the way? Leland: When I had first got out, I was an aviation technical adviser on five movies and part of it was I would rewrite part of the script sometimes and that got me started. 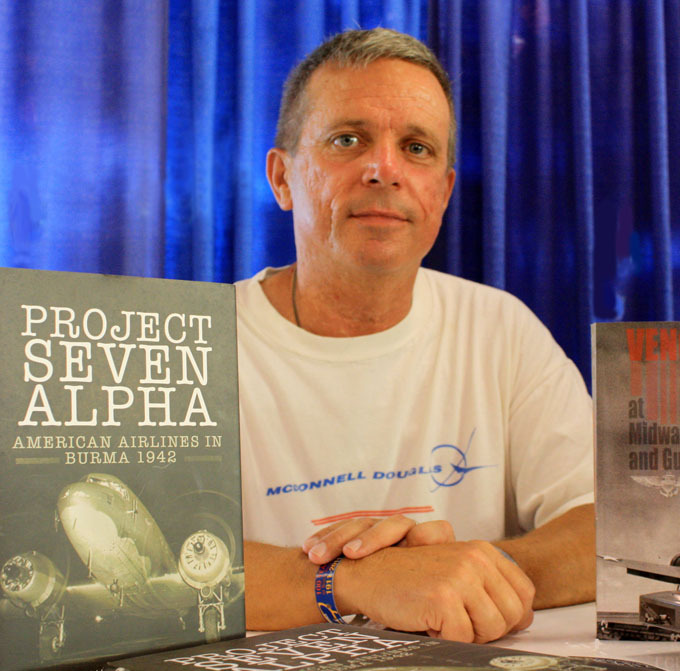 And then my first book was called Project Seven Alpha. I saw a plaque in the training center at American Airlines. So I was just kind of intrigued by it and looked it up and what it was is early in the war, they are really having trouble with staying in the air force, getting enough people to fly missions over the Himalayas, over the hump out of India and China and Burma. And so FDR asked CR Smith, president of the American Airlines at that time to basically stand up a squadron and send it to the Assam Valley in India to fly combat missions into China and Burma. So they put together a group of mechanics and operations guys and air crew and cargo in and good soldiers and whatever else needed to come out. It was really interesting, historical little tiny window of all the sacrifices that was going on. Chris: Right. How did you get into that material and dig into the history of it and find out more? Leland: I got real lucky. I was surfing around on the internet, and you’re too young I can tell by your picture. But back in the old days, they didn’t really have Xerox machines. They had these crank-type copiers and they had purple ink and I found one that the guy who had run the operation Project Seven Alpha, he had published a summary that they sent to the airline in 1946 and someone scanned that original copy into the internet and I was able to get a copy of it and that pretty much was blueprint of the book. Chris: Wow, so it was like a written history essentially of what they had done, so like kind of day to day operations of the “airline” in China if you will? Leland: Yeah, and it got down into some details like they had a group and I even put in the book, a group of guys that were really kind of whiners and so they fired them in India and sent them home. Leland: It had some really good details in it and some insight into some of the personalities and they lost one full crew and then another captain, they were flying back into the Assam Valley and the weather could change without notice, especially it could fog over, and the Assam Valley fogged over and they didn’t had the fuel to go anywhere else. So he held the aircraft while his crew bailed out but he was not able to get out so that was the other loss. Chris: Wow. Okay, so let’s circle back a little because I don’t think we made this clear enough to the listeners, so Leland, you’re an author as well, you’ve written from what I could see four to five books, how many books have you actually written? Leland: I’ve got a chapter in a test pilot book that is a non-fiction. I also wrote a non-fiction a while back but that’s not available anymore. And then I am writing my fifth novel right now. The fourth one is scheduled to be published on 21st July. And these are all the aviator series. Each one is a standalone novel but it’s the same characters. And the first one is early World War II and the second one, Vengeance at Midway and Guadalcanal, picks up at the beginning of the war, follows a young naval aviator through training and through the Guadalcanal campaign. And then the third one, Endgame in the Pacific, that wraps up the Pacific War. There are some characters in Europe as well so you get both sides of the World War II. And then the fourth one is right at the end of the war and it’s got a little bit of a twist in more of an alternate history type twist to one of the main characters, SS General escapes Germany as it dissolves with nuclear weapons and their chase is on after that. Chris: Wow, that sounds very interesting. And I apologize for not having time to read one of your books. I’m definitely going to pick one of them up, probably the Midway one. I’ve always been fascinated with the Battle of Midway. So essentially, you’re doing historical fiction right? Leland: Absolutely. Yeah, I take the timeline, like in the Battle of Midway, I just took the ship’s log from various ships in the battle group and used that timeline, then inserted my characters. I know a lot about old airplanes and I’ve flown obviously from that era. I hope I landed some genuineness but it’s a lot of fun. I enjoyed doing it. Chris: That’s really great. So, kind of while we’re on this subject, I think we’ll probably hit this now. Because it’s Memorial Day, I thought it would be an interesting opportunity for you to share what your experience like and what your connection is to, I guess that sacrifice if you will that our military has made for this country and specifically kind of an aviation look on that because I think a lot of the time, as a nation we think of the guys that are on the frontlines and boots on the ground and from our perspective obviously being interested in aviation, we always wonder what it was like for aviators in the different wars. So kind of an open-ended, I guess just opening of a discussion there to get your thoughts on Memorial Day and the things you think of on this day I suppose. Maybe people in your life that you know that have passed on or that have impacted you. So I’ll just open that up and kind of see where it goes and maybe prod you a little bit. Leland: Sure. Well obviously for me, I was seven or eight years old when my uncle was killed in an accident and then my uncle Bob Milahan, he was actually shot down a couple times in Vietnam but was always able to, he flew an AC-119 gunship, but was always able to get to an alternate field and so he made it back unscathed. But it is personal. I think for aviation, it’s different. It’s more of a continuous like slow burn if you will because for example, the first week of the gulf war, I think we lost more aircraft in the training command or stateside than we did at least for the navy because of training accidents. Chris: Than you did in the actual war right? Leland: Yes, right on. It’s just a dangerous business, especially landing on the ships. And for your average person and I see it on the news, boom boom, flash, it’s gone, but when you live it, I mean that hole is there forever. That person you lost, whether it’s a relative or not. On my first cruise, we lost an EA-6B rounding a tip in India. Never knew what happened. They took off and just never came back. Commanding officer was in it. Was going to be the night of his 1000th career landing which is a big deal in navy. And they just never came back. That’s something in naval aviation that happens quite often. It’s a big ocean and if they don’t find any of the parts quickly, they sink. What I think about is the families because I saw it affects the families and it never goes away. Leland: Well, my airline has actually been doing what we call honor flights where we try to take the World War II vets to Washington DC to see the war memorial. That’s been going on for a few years now. But yeah, people have no idea how many, well, just naval aviation for example. When I got my wings in the 80s, my instructor told me “Since the beginning of naval aviation, 80,000 guys were winged with naval aviator wings.” And he said “And 60,000 of them are winged in a 4-year period during World War II.” So that gives you some idea of how many people are out there, what percent of the population, and it’s so much smaller now. Chris: Right definitely. It’s a rare breed these days but one that is still very much appreciated so on behalf of the listeners, I thank you for your contribution to that and also all those out there listening that have contributed to our military, not just naval aviation but anyone that has fought to protect our freedoms. We are all here to give a shout-out to them, a big appreciation for that. So let’s move on from that. Let’s talk about your airline career. Let’s talk about transitioning from being a military pilot into the airlines. It sounds like that was kind of a direct thing that you did. Tell us more about that transition, if it was difficult going from a fighter jet to an airliner. Tell us about that a little bit. Leland: Sure. Well, I retired, we moved back. My wife and I had grown up here in St. Louis, little suburb and we moved back with our four kids. And I was working for air cargo company called Kitty Hawk, flying 727s. I got on with them, went through training. A couple months later got furloughed. So I was laid off, substitute taught while I scrambled and get applications with other airlines, and while I was furloughed, I got hired by American Airlines. Then I started at American I guess in June ’99 and I got hired into the MD-80 and I mostly stayed on the MD-80 oh gosh for 15 years I guess. Great old airplane, 50s/60s technology, and then I transitioned from that to the 777 which, that was a transition. Leland: I kept hearing the old joke in my mind or was it an old captain sitting in front of a new glass cockpit turns to the instructor and said “Now I know what a dog feels like staring at a TV.” And it’s kind what it feel. It’s very different. And the flying was very different. You go from short hops, wanting to fly as much as you can, to three legs, four legs a day and you’ve had enough by mid-month. So it’s very different. The hard part is to try to keep it from becoming a job. With all the turmoil, things were great when I started the airline and the 9/11 hit and the tech bubble crashed and it devastated the airlines pretty good. All the bankruptcies and everything else, that was pretty tough. But the actual flying is quite a bit different. An ILS is an ILS, that’s the instrument landing system, and GPS was new, that was coming in, which was nice. You get spoiled with GPS real quick. Leland: When I was flying the A-4, we had basically a compass and a tack-in and that was basically it. In the F-4, we did have a GPS called the Poorman’s HUD. It was a first generation Garmin that would just bolt into the glare shield. But since we were a test squadron, we could sell for prove so we didn’t have to go through all the red tape to get that done and that worked pretty good. And then having big crews and a bunch of people behind you. Flying’s flying. Chris: Where do you typically fly? You said you’re based in Miami? Leland: I am. I fly the 777 out of Miami. We generally go to London, Madrid, Buenos Ares, Sao Paolo, Rio and Santiago. So usually 8/9-hour flights and three-man crews. Chris: Gotcha. So you’ll have one relief pilot? Leland: Yeah, and we have a bunk room so you get a couple hours sleep each flight and that helps a lot. Chris: Now, are you flying, American only has the 300, is that right? Leland: No, we have 200s and 300s. Chris: What are you typically flying on those routes? Leland: Usually the 200. Sao Paulo is the 300. The 300s I think, it go to London and Sao Paulo out of Miami. And then out of Dallas I think they go to Hong Kong. We’re just starting to get 300s. We’re getting a couple more this year as a matter of fact. Chris: Yeah, I remember that kind of being the flagship rollout for when you guys changed your paint scheme. They have the brand new 777-300 and the new head scheme and that was a big deal. Leland: Yeah, it’s a great airplane. It really flies nice. The flight characteristics of it are pretty amazing for the size of the airplane. It’s the easiest airplane I’ve ever landed I think. Chris: Well you’ve had some difficult landings so I think that anything from there is a little easier. Leland: Oh it’s a nice airplane. I really like it. Chris: So, tell us a little bit more, some of the conversations we’ve had on the show, we talk a lot about automation dependency. What are your feelings on that and what’s kind of the policy of American in allowing the pilots to actually handfly the aircraft. Leland: Well, we have always handflown at American, most of the guys I fly with anyway, general they don’t fly it. Now with the new reduced spacing, you had to have the autopilot on and I think at 28. So most guys handfly it up into the 20s and then turn the autopilot on for the cruise person. It’s very rare you do an autoland or CAT-3 or CAT-2 landing. Guys land them by hand. And our training is we’ve always done unusual attitudes and one thing that they’ve added a few years back is they’ve been having all these multiple failures in the automation and instrumentation stuff, so we actually will fly an approach in training every nine months where virtually nothing works, no airspeed, no optimeter, VSI, none of the magic. And we got to bring it back and do a raw data ILS to landing and just power and attitude. Power and attitude equals performance. Chris: Yep. Just like the old days. Putting it down on the carrier deck. Just put that Angle of Attack and bring it down with power right? Chris: Cool. So a lot of our listeners are a mix of several different things. First, they are younger pilots or even middle age guys that are looking to get their pilot’s license, looking to get into aviation. We also have people that are, kind of going back to something you said, looking to keep their passion alive, so making sure that their aviation jobs don’t just become a job that they kind of keep that passion alive. What would you say for, let’s start first with the new pilots and then let’s get to the keeping the passion alive subject if you don’t mind. Leland: Sure, sure. Well, the new pilots, man, they’re gonna inherit the earth. I happen to know exactly what the average age of American Airlines is. It’s starting to change now but for a long time, the average age of both seats at American Airlines was my age, and I’ll be 57 in September. So virtually 90% of my airline is going to retire in a very short period of time. So the advancement and the opportunity that’s out there for the young guys is gonna be fantastic. Obviously you want to be on the first half of the power curve on that. First half of the guys in will be captains. Second half won’t. That’s the way it works. But yeah, the opportunity, and it’s not just my airline, it’s just about every airline out there. We’re very old as a group, the airline pilots which is why I think they raised the age to 65 just to keep the can down the road a few years. Leland: And they may try to 67 but I can tell you, I’m not going to fly that long. Not day to day. Not for the airlines. It wears on you after a while. But for the young guys, the opportunity is just incredible and it started but it’s really going to pick up here in the next two to three years. Chris: What would be your, any advice for them to kind of jump on the bandwagon, what would you say? Leland: Well, it’s the same advice that’s been out there forever. You got to get your flight time and you got to get out there and hit the street and ask people to help you. One of the things I’ve always loved about this perfection is that the old guys are really more than willing to help the young guys. And it’s a theme I try to cross to my books as well, is they feel that they have to give back to the next generation. And so I help guys all the time, whether it’s job recommendation or whatever. You need to get out and meet some guys or throw in a jumpseat, talk to the captain. And you’d be surprised, most guys will offer up that help without even being asked. And then obviously, jet time, turbo prop time. That’s multiengine. That’s what you need. But when you go, it’s all about the interview. Everybody is there because they’re qualified, and it’s all about the interview. Now with the internet, it’s so much easier. We used to have this box when I was in the navy. Guys were getting out, they call it the ark of the covenant. Because back then, there were so many airlines and each airline kind of did their own thing as far the inner process and it had everything in there. What to wear, what not to wear. The blue suit, white shirt, power tie, all that stuff. What you don’t want to do is be the guy that sticks out. When you do get the interview, you really have to spend some time and there are those quite a few services out there that will prep you for your specific airline interview and I think it’s worth it. Chris: Yeah, that seems like a smart idea if you’re really gunning for it. Alright, so what about the guys that are maybe becoming a bit disenfranchised or losing the passion for it. What do you do to keep your passion alive? Leland: Well, and trust me, I know exactly what you’re talking about. We started flying 80 hours a month. This job, you have to understand, it comes with a lot of family separation whether you’re on a ship for six months or you’re gone half of every month. You’re going to be gone. You’re going to miss holidays. You’re going to miss birthdays, all those family sort of things. So it really does get hard to keep the motivation. For me, I write my books, do things in movie and TV industry, we did a documentary a while back for discovery called Plane Crash, and we droned a 727 filled with experiments for survivability and then crashed it in the Sonoran Desert. It was droned. Leland: Yeah, it was. And I was controlling it. It was my company who put it together and we had a great time doing that. I brought in my friends and a couple of my kids and put together a great show and had a lot of fun. And then tomorrow morning, I’m actually leaving to go get a CJ-6 Alpha Nanchang, a little Chinese trainer with a round engine in it, and I just want to put some vitamin G back on my body again, have some fun flying. Chris: Some vitamin G, I like it. Is that an aircraft that you’ve bought, that you’re faring back to St. Louis? Leland: It sure is. It’s out in Phoenix. I’m going to go out and pick it up, get trained in it tomorrow and probably start back on Wednesday. Chris: Great. Do you own any other airplanes? Leland: I have a quarter share of a Musketeer, both of them are 1966 models as a matter of fact. And keep it out here at St. Louis Airport. Chris: Great. Well it sounds like you’re doing many different diverse things I guess, keeping your passion alive, and I think that’s what it takes. I think at the end of the day, it comes day to diversity, get out there and trying different thing and getting kind of out of the mundane routine because a lot of these younger aviators that are so excited about their aviation career, I know it was this way for me and although I didn’t end up going to the airlines, I know just with my body of friends and acquaintances that at some point, it does become a job. And if you can make sure that you are reminding yourself in some sort of way that this actually kind of isn’t just a job, that this is a pretty cool, then it takes the edge off of it I guess and makes it a little better. Leland: Oh yeah, yeah, absolutely. Chris: Well I appreciate you taking the time to meet with us today. You and I kind of wrote over the weekend and you said that you were going to go pick up that aircraft in Phoenix so I thought it would be a fantastic opportunity to meet now. Any final words for our listeners? Any places you want to direct them, like your website, things like that? Leland: Oh yeah. LelandShanle.com. You can find my books there. You can get any of my books there. You can preorder the fourth one, and just keep flying and have fun. Remember to have fun. If you’re not having fun, you’re not doing it right. Chris: Awesome. Well, I appreciate the time Leland. We’ll make sure we plug your stuff and great job. I’ll be reading one of your books soon. Chris: I appreciate it. Take care Leland, see you. Leland: Alright, you too. Bye.